For the hydrocarbon liquid stream derived from the refining of crude oil, see Petroleum naphtha. Not to be confused with Naphthalene. Naphtha (/ˈnæpθə/ or /ˈnæfθə/) is a flammable liquid hydrocarbon mixture. Mixtures labelled naphtha have been produced from natural gas condensates, petroleum distillates, and the distillation of coal tar and peat. In different industries and regions naphtha may also be crude oil or refined products such as kerosene. Mineral spirits, also historically known as “naphtha”, are not the same chemical. The word naphtha is from Latin and Ancient Greek (νάφθα), derived from Middle Persian naft (“wet”, “naphtha”), the latter meaning of which was an assimilation from the Akkadian napṭu (see Semitic relatives such as Arabic نَفْط nafṭ (“petroleum”), Syriac ܢܰܦܬܳܐ naftā, and Hebrew נֵפְט neft). In Ancient Greek, it was used to refer to any sort of petroleum or pitch. In the Song of the Three Children the Greek word νάφθα designates one of the materials used to stoke the fiery furnace. The translation of Charles Brenton renders this as “rosin“. It enters the word napalm, a contraction of the “na” of naphthenic acid and “palm” of palmitic acid, originally made from a mixture of naphthenic acid combined with aluminium and magnesium salts of palmitic acid. Naphtha is the root of the word naphthalene, and can also be recognised in the word phthalate, and the paint colour phthalo blue. In older usage, “naphtha” simply meant crude oil, but this usage is now obsolete in English. It was also used for mineral spirits (also known as “Stoddard Solvent”), originally the main active ingredient in Fels Naptha laundry soap. The Ukrainian and Belarusian word нафта (nafta), Lithuanian, Latvian and Estonian “nafta”, the Russian word нефть (neft’) and the Persian naft (نفت) mean “crude oil”. Also, in Albania, Bosnia and Herzegovina, Bulgaria, Croatia, Finland, Italy, Serbia, Slovenia, nafta (нафта in Cyrillic) is colloquially used to indicate diesel fuel and crude oil. In the Czech Republic and Slovakia, nafta was historically used for both diesel fuel and crude oil, but its use for crude oil is now obsolete and it generally indicates diesel fuel. In Bulgarian, nafta means diesel fuel, while neft, as well as petrol (петрол in Cyrillic), means crude oil. In Nafta is also used in everyday parlance in Argentina, Paraguay and Uruguay to refer to gasoline/petrol. 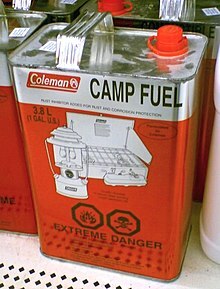 In Poland, the word nafta means kerosene,, as in lampa naftowa “paraffin lamp“; crude oil and (colloquially) diesel fuel are called ropa “pus”. In Flemish, the word naft is used colloquially for gasoline. There is a hypothesis that the word is connected with the name of the Indo-Iranian god Apam Napat, which occurs in Vedic and in Avestic; the name means “grandson of (the) waters”, and the Vedas describes him as emerging from water golden and shining “with bright rays”, perhaps inspired by a burning seepage of natural gas. Light naphtha is the fraction boiling between 30 °C and 90 °C and consists of molecules with 5–6 carbon atoms. Heavy naphtha boils between 90 °C and 200 °C and consists of molecules with 6–12 carbon atoms. Light [is] a mixture consisting mainly of straight-chained and cyclic aliphatic hydrocarbons having from five to six carbon atoms per molecule. Heavy [is] a mixture consisting mainly of straight-chained and cyclic aliphatic hydrocarbons having from seven to nine carbon atoms per molecule. Both of these are useful definitions, but they are incompatible with one another. These terms are also sufficiently broad that they are not widely useful. Naphtha is used to dilute heavy crude oil to reduce its viscosity and enable/facilitate transport; undiluted heavy crude cannot normally be transported by pipeline, and may also be difficult to pump onto oil tankers. Other common dilutants include natural-gas condensate, and light crude. However, naphtha is a particularly efficient dilutant and can be recycled from diluted heavy crude after transport and processing. The importance of oil dilutants has increased as global production of lighter crude oils has fallen and shifted to exploitation of heavier reserves. Venezuela, which produces some of the thickest crude oil in the world, is a major importer of US naphtha. In 2019, US imposed sanctions that included an embargo on US naphtha sales to Venezuela, significantly hampering Venezuelan oil exports. The safety data sheets (SDSs) from various naphtha vendors are also indicative of the non-specific nature of the product and reflect the considerations due for a flammable mixture of hydrocarbons: flammability, carcinogenicity, skin and airway irritation, etc. Humans can be exposed to naphtha in the workplace by inhalation, ingestion, dermal contact, and eye contact. The US Occupational Safety and Health Administration (OSHA) has set the permissible exposure limit for naphtha in the workplace as 100 ppm (400 mg/m3) over an 8-hour workday. The US National Institute for Occupational Safety and Health (NIOSH) has set a recommended exposure limit (REL) of 100 ppm (400 mg/m3) over an 8-hour workday. At levels of 1000 ppm, which equates to 10% of the lower explosive limit [1% = 10,000 ppm], naphtha is immediately dangerous to life and health. ^ Christian Gizewski (Berlin Institute of Technology). “Persisches Erbe im Griechischen, Lateinischen, Arabischen, Türkischen und in verschiedenen heutigen europäischen Sprachen (Persian Heritage in Greek, Latin, Arabic, Turkic and Various Modern European Languages)”. Technische Universität Berlin. Retrieved 2010-02-28. ^ David Neil MacKenzie (1971). A Concise Pahlavi Dictionary. Oxford University Press. p. 57. ISBN 978-1-934768-59-4. ^ “ENGLISH i. Persian Elements in English”. www.iranicaonline.org. Encyclopaedia Iranica. Retrieved 1 September 2018. ^ “Slovenské slovníky”. Slovnik.juls.savba.sk. Retrieved 2015-10-26. ^ Pedro Mairal (2012). El año del desierto. Stockcero, Inc. pp. 71–. ISBN 978-1-934768-59-4. ^ Andrey Taranov (23 October 2013). Polish vocabulary for English speakers – 7000 words. BoD – Books on Demand. pp. 98–. ISBN 978-1-78071-417-2. ^ Michael G. Clyne (1992). Pluricentric Languages: Differing Norms in Different Nations. Walter de Gruyter. pp. 85–. ISBN 978-3-11-012855-0. ^ R. J. Forbes (1966). Studies in Ancient Technology. Brill Archive. p. 13. GGKEY:YDBU5XT36QD. ^ Prestvic, Rune; Kjell Moljord; Knut Grande; Anders Holmen (2004). “Compositional analysis of naphtha and reformate”. Catalytic naphtha reforming. USA: CRC Press. p. 2. Retrieved 2010-02-03. ^ “Chemistry of Hazardous Materials, Third Edition”, Meyer, E., Prentice Hall, 1998, page 458. ^ Glenat, Philippe; Heraud, Jean-Philippe; Gateau, Patrick; Henaut, Isabelle; Argillier, J.-Francois (2005-01-01). “Heavy Oil Dilution”. Society of Petroleum Engineers. doi:10.2118/97763-MS. ISBN 9781613990056. ^ a b “Dilution of heavy crude oils for pipeline ransportation purposes: The asphaltene instability issue”. ^ a b “Diluting Venezuela’s heavy crude just got harder”. www.worldoil.com. Retrieved 2019-04-09. “Petroleum Ether”. Hazard.com. 1998-04-21. Retrieved 2015-10-26. “Material Safety Data Sheet : Shellite” (PDF). Recochem.com.au. Retrieved 2015-10-26. “Material Safety Data Sheet : Ronsonol Lighter Fuel” (PDF). Cooperbooth.com. Retrieved 2015-10-26. “CDC – NIOSH Pocket Guide to Chemical Hazards – Naphtha (coal tar)”. www.cdc.gov. Retrieved 2015-11-27.